Jack Schwager is one of the leading experts on investing advice in the commodities and stock market. He is well known for his work as an author, analyst, trader, and public speaker, and is a member of the Elite Trader's Hall of Fame. Schwager is the author of Fundamental Analysis, Technical analysis, Managed Trading: Myths and truths, and Getting Started In Technical Analysis. Part of Schwager’s knowledge and investing advice comes from his diligence to figure out the secrets of top traders. Jack Schwager provides an amazing insight and investing advice into the stock market industry. He has taken an approach that has worked very well for those wanting to learn more and get better at investing in stocks. Schwager’s approach of talking to successful stock traders and getting those insider viewpoints into the work of stock trading has served to make him one of the most respected authorities on the topic of trading. Now Imagine having an in-depth conversation with not one-but dozens of the world's greatest traders. 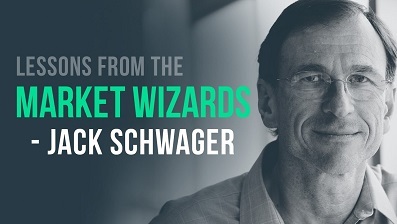 Jack Schwager has, and his three best-selling Market Wizards books reveal intimate secrets of the trading superstars. His Complete Guide To Mastering The Markets Trading Course is also considered a classic. Below is a great video interview with Jack Schwager in which he summarizes the major stock trading lessons he learned from interviewing the great stock traders of the world. Over your long career in the markets you have interacted with some of the greatest traders. Could you share with us investing advice and what you perceive are the qualities of great traders? There are really very many. I will give you a few key ones. First on the list would be discipline. I can't think of anybody I have interviewed or met as a trader who has been very successful but has not been disciplined. I think that's probably an absolute essential. Secondly, money management and risk control is certainly critical in one form or another. Most of the traders that I have interviewed will be the first to acknowledge that they consider money management actually more important than the methodology. The other thing that is definitely worth mentioning is that successful traders find an approach that fits their personality. Time and time again, I see that the method that a trader is using very much reflects that person's characteristics or natural tendency. For example, when I interviewed Paul Tudor Jones, he set a time that was during market hours. At the same time I was interviewing him, phones were ringing, people were coming in with messages, and he was watching multiple monitors around his office and yelling out orders on open phone lines to a number of different floors. It was almost complete bedlam, but he actually thrived in that type of atmosphere. That's the way he traded. Another trait certainly worth mentioning is confidence. It's a bit of a chicken-and-egg question. Are great traders confident because they succeeded or do they succeed because they are confident? I don't know whether this question is clearly answerable, but I can say that when I am looking for people I think are going to be successful as traders, especially now that I am working as a fund of funds manager, confidence is certainly one of the characteristics I consider. Of course, one person's confidence could be another person’s cockiness, and it can be a thin line between the two. I can think of traders that I have interviewed who some people would consider conceited or egocentric, but whom I saw as extremely confident in what they were doing. Trading is also hard work. People are often attracted to markets because they think it's an easy way to make a lot of money. But in reality, the people who are successful work very long hours. Sometimes they work every day, rarely taking vacations, and even if they take vacations, they are still involved. These people are not attracted to trading as a way to make easy money. The traders who really succeed are the ones who work very long hours, very intensively, often to the point of obsession. In your opinion are traders born or made and how much of trading is an art and how much is a science? I’ll use a running analogy to answer that question. Running a marathon is a very difficult thing to do, but people who are determined to do it, even if they are handicapped, can train and complete a marathon. Someone fit but not trained could never do it without that type of work. Running a marathon at a world class speed, say 2:12 for men, is a feat that most people are going to find is impossible because their bodies are just not biomechanically designed to be able to achieve that result. No matter how hard they train, no matter how determined, no matter what their emotional strength is, they are not going to be able to achieve that type of a standard, because it is just physically impossible. They may run a marathon, and they may even run it in reasonably good time, but they won’t run in it in a world-class time. A few people will be able do it because physically they have the right type of body. It has to be a combination of both the physical capability and the determination and hard work. Now the analogy applies to the trading side in the following way. Most people if they work hard enough, are disciplined enough, and follow all the basic rules that I tried to outline as being common denominator traits of great traders will make profits in the markets and certainly do better than the average person. But will they be market wizards? Well no. I mean most of them won't be any more successful than most people would be as world-class runners if they went into running, or more than most people would be as world-class solo musicians if they decided to take up music. To reach exceptional success in trading or anything else requires a combination of both innate and hard work to exploit that talent. That's sound investing advice. What are some of the methods and investing advice that traders use to control market risk? Some people try to make risk control very complex. I don’t think risk control has to be rocket science. Even the very simplest rules can get you most of the way towards risk control. For example, even a very simple rule such as never risking more than say 2 percent on any individual trade would get you 90 percent of the way towards an effective risk control methodology. Methods of risk control could include limiting losses on individual trades or limiting portfolio risk by reducing overall exposure levels. Risk control does not necessarily imply the use of explicit's, but may instead be achieved by hedging positions wherein every long is matched by a short that is linked in some way. None of those approaches are by themselves in any way complicated. The key point I'm trying to make here is that it's not the complexity of risk management that is important, but rather the discipline to apply it. I would argue that the simplest money management strategy applied with absolute discipline is superior to the most sophisticated approach applied with anything less than that. And so in your opinion what is it that causes traders to lose most? That's easy. The answer ties in exactly to what we were just talking about, namely insufficient risk control. It is one of the most common reasons why traders get into trouble. One way or the other, the cause for large losses and traders blowing up is insufficient risk control. This is basic investing advice. You also stated in one of your books that there is no Holy Grail or grand secret to the markets. But there are many patterns that can lead to profits. Could you elaborate on some of the patterns that you have discovered? It is simply a statement of the fact and investing advice that all successful traders are using patterns. Whether they are purely fundamental traders or purely technical traders or some combination of the two. The specific patterns depend on the market and the personal approach of the stock trader. For example, a technical stock trader might use trend following signals or chart patterns or something like that. A fundamental trader, on the other hand, might look for some combination of valuation metrics and a catalyst. An arbitrage trader would be looking for value deviations between related instruments. One way or the other, every successful trader is really using an approach that depends on some sort of pattern. I would argue that that even traders who think they trade intuitively are still using patterns. For so-called intuitive traders, after watching the markets for many years, a current trading situation may trigger their subconscious memories of similar situations in the past. Thus their decisions, which seems instinctive, are really pattern based, even though they may not be aware of it. This concludes the Interview and Investing Advice with Jack Schwager. The Complete Course for Stock Trading Success! Return From "Stock Investing Advice: Jack Schwager" to "Stock Advice & Interviews"
Return From "Stock Investing Advice: Jack Schwager" to the Home Page "Stock Market For Beginners"